Rising 7,000 feet above the town of Jackson Hole in Wyoming, the Teton Mountain Range, while only about 40 miles long, is a dramatic sight. Standing out among the peaks is Grand Teton, towering at 13,770 feet. I set out with five friends in an attempt to free solo it. 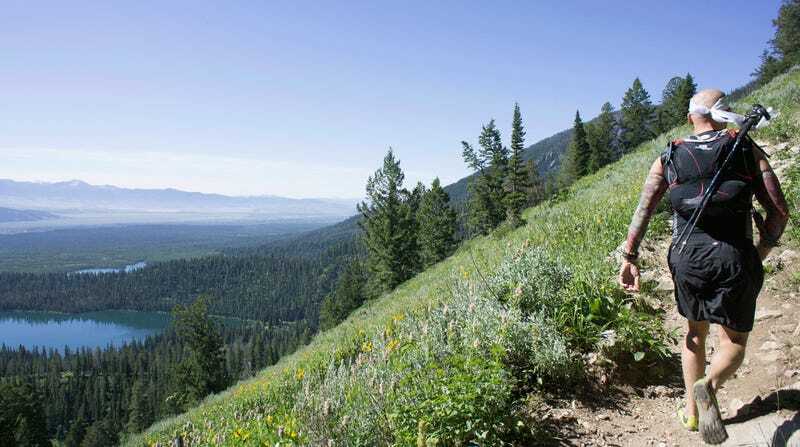 If you go: Day hikes do not require passes from the Grand Teton National Park, but if you plan to do an overnight trip, you will need to get a backcountry permit from the Grand Teton National Park Service. Armed with the knowledge that the fastest known time up and down the Grand Teton along this very route was right around 2 hours and 53 minutes. We figured we should be back to the car in like three hours, no problem. Having traveled from Arizona and California, we were very fortunate to be able to stay at a family cabin on Henrys Lake in Idaho, which is renowned for its trout fishing. A three hour drive to the trail head set us off to a bit of a late start, but we were determined and ready for an adventurous day up to the summit of the Grand. Spirits were high. After only a few miles, we were greeted with some of the wildlife Grand Teton National Park has to offer. Ryan and I were a few minutes ahead of the other guys and heard something large off the side of the trail. We stopped to inspect, expecting an elk or a deer, but no, it was the world's cutest little black bear cub (seen climbing a tree below) and his brother, followed closely by big momma. Momma did not like said activity and proceeded to rear up on her haunches and bluff us away, we quickly obliged and kept running along. There's mommabear standing up, to the right of the trail. Photo taken from safe distance. The bear sighting was pretty awesome so early on, especially since we had all been here a year before to hike the 40 miles around the Tetons along the Teton Crest Trail and did not see a single bear over the 4 day trek. After that excursion, we were convinced that grizzlies and black bears were a myth. Thank you momma for setting the record straight. We pressed on, energized by fear. The views were dramatic as we quickly zigged and zagged our way along the switch backs as we climbed towards the ever looming Grand Teton. With Taggart and Bradley Lake in the background, Ryan skips along like a ninja. The miles started to add up and so did the elevation, we found ourselves slowing as both Chance and Jake were still recovering from two broken ankles and a torn hamstring, respectively. Scotty on the other hand was battling something inside his stomach. Our crew would not let this hold us back though, we continued to toward Garnet Canyon for a snack break. At nearly 10,000 feet, the elevation was quickly catching up to us and we slowed to a steady hike. The snow melt in Garnet Canyon was so fresh and cold, it quickly restored energy to our aching bodies. By this point, we had just now passed the two hour mark, our hope of summit and returning to the car in 3 hours was quickly floating away. After another long set of switchbacks, we hopped through the boulder fields and chose the snowy boot pack over the crowded summer rope route to get to the lower saddle. The lower saddle divides Grand Teton from Middle Teton and sits at 11,600 feet. Hopping across the boulders was not required, but added to the adventure. Ryan and I both had traction devices. He had a single spike under his arch while I was using the more aggressive Kahtoola Micro Spikes. (It's worth noting that we were both able to fly with these items as carry ons). Isaac on the other hand, went at it like a man with no such traction assisters. While he did make it, both Ryan and I had a much easier time climbing the snow. We reached the lower saddle, stopped for lunch, and took inventory of the weather. So far we had been thoroughly blessed with bluebird skies all day. Grand Teton is notorious for having very fast changing weather with afternoon thunderstorms frequenting the summer months. The forecast had called for gusty weather, but until we had reached the saddle, we had no idea what we were in for. We were forced to seek shelter from the 40+ mph winds that were thrashing us while we ate lunch and loaded up for the final ascent. We still had another 2,170 feet of vertical to gain and all of the technical climbing ahead of us. At this point, our trek had split in to two groups of three. Ryan, Isaac, and I pressed on to the summit while Scott, Chance, and Jake followed not too far behind. After about another half mile, right before the start of the rock scrambling, we stopped to take a vote. The wind was howling and there are sections of the climb were you are crawling on your belly along the side of a sheer 2000 foot cliff. It was with a heavy heart that we had to make the safe decision to turn around. We had spectacular views of Jackson Hole and the lower saddle off to the east, with the rest of the Teton Range that we had hiked last year along the Teton Crest Trail over to the west. 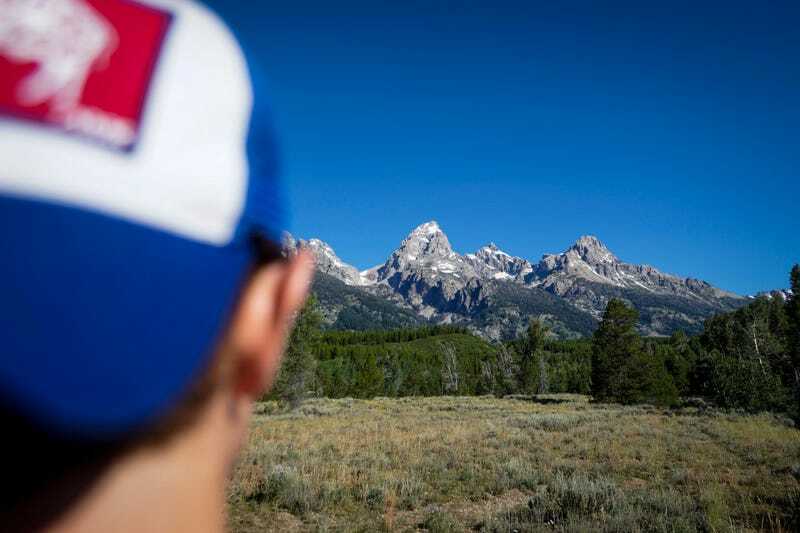 Isaac gazing over Middle Teton. The highest point of our trip, 12,250'. Check out a panoramic view from the top here. 360 degree Panorama from just above the lower saddle. Very Helpful guide to the Owen Spalding Route also showing the widely exposed Belly Roll- Image courtesy of WyomingWhiskey.org. We quickly re-traced our steps — while trying not to get blown over — to the lower saddle and rendezvoused with Scotty, Chance and Jake. They were not too difficult to convince to turn around. We made quick work of the last seven miles, taking the rope route on the way down. Chance using the Ranger Station provided ropes for descending. Check out the GPS data from our run below (my phone bugged out for a bit shortly after turning around). We made it about eight miles before being forced to turn around, which made the whole day a solid 16 miles. We stopped by The Snake River Brewing Company in Jackson Hole for a celebratory beer and bison burger. Once back at the cabin, we were again blessed with a beautiful clear night sky, with the Milky Way clearly visible with the naked eye. A single 15 minute capture of the Milky Way. While we were bummed to have not made it to the top and didn't break the record for the fastest car to summit to car, this adventure's success is not measured simply in whether or not we have the summit in our bag, we had one amazing trip with plenty of stories to share. There is always next year! What We'd Do Differently: For an intense adventure like this, being prepared is key. We got a late start on the trail, which is never good. Many people turn trip this in to a two day hike and camp near the lower saddle so they can make a quick attempt on Grand's summit. This also allows for doing more technical rock climbing routes. What should you do while you are there? Yellowstone National Park is less than an hour away and should be on everyone's to list if you are in the area. While the hot springs and Old Faithful doing her thing are super cool to look at, one of the best parts of the trip was swimming at the Firehole Swimming area in the Yellowstone park. The water was the perfect temperature and there were plenty of sweeping canyons to swim through. The area can get crowded during the summer though, mind the rednecks and clean up after yourself please. Fishing is wildly popular in the area and many locations in Yellowstone only allow fly fishing (fishing license required). I personally will not keep anything if I can drive to it and cast out. I think that it helps preserve the population of the river just a little more.